I’d like to share with everyone how my expenses have matched the projected budget we had. 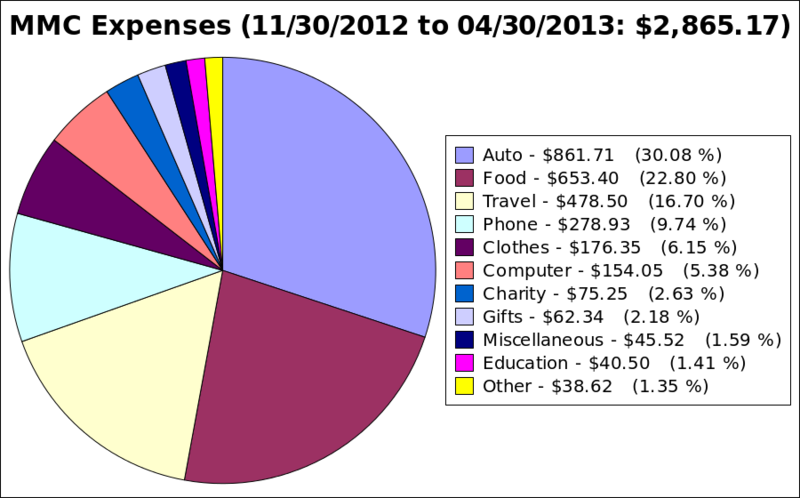 As of April 4, 2013 the total received is $2,459, which is about 2/3 of the projected budget. Update: as of April 10, the total is $3,190 or a little over 80% of what’s needed. One thing to point out is still running. We had orginally budgeted for 16 weeks, but by the time I leave the USA on April 26 I will have been here for a total of 20 weeks or 25% more than expected. Other costs including clothing and sundries have been pretty much what we expected. On the down side, we underestimated by a lot the cost of the return trip to the UK, so it will be double what we estimated ($900 instead of $400). Luckily because of a £200 voucher from British Airways, it brings this cost down to around $600. Also the cost of having a phone here in the US was more than twice what I thought it would be, and because I travel so much it has been a critical part of staying in touch with everyone. So given that the length of stay is 25% longer than expected and that we’ve just about raised 65% of what we budgeted and that I’m happy and healthy, I think we’ve done an amazingly good job, don’t you?